SNC is one of several companies working to develop commercial crew transportation capabilities under the Commercial Crew Development Round 2 (CCDev2) agreement with NASA's Commercial Crew Program (CCP). The goal is to help spur innovation and development of new spacecraft and launch vehicles from the commercial industry to develop safe, reliable and cost-effective capabilities to transport astronauts to low Earth orbit and the space station. 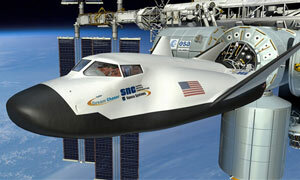 The Dream Chaser is designed to carry as many as seven astronauts to space. It is the only spacecraft under CCDev2 that uses wings and is designed to land on a conventional runway. "As CCP's partners meet these critical milestones, we are moving in the right direction in our combined effort to advance commercial capabilities that could eventually transport NASA astronauts," NASA CCP Program Manager Ed Mango said. This marks the 17th milestone to be completed by SNC during CCP's initial two development phases. The PDR included a review of the entire orbital flight program, including the Dream Chaser spacecraft, and associated mission and ground systems. The company also reviewed the spacecraft's compatibility with its initial launch vehicle, the United Launch Alliance Atlas V rocket. "Our program includes 12 industrial partners, 7 NASA Centers and 3 universities from over 20 states who helped us achieve two major program milestones this week. With the completion of PDR and the beginning of our vehicle's flight test program, the Dream Chaser Program has now entered the next phase of its development. We are proud to be included with the other CCDev companies in developing a US crew capability to low earth orbit," said Mark Sirangelo, Corporate Vice President and head of SNC's Space Systems. The final PDR board meeting was conducted shortly after the company successfully completed a captive-carry test of its full-scale Dream Chaser test flight vehicle May 29. The flight met all its test goals and moved the program a step closer to preparing the vehicle for an autonomous approach and landing test scheduled for later this summer. All of NASA's industry partners, including SNC, continue to meet their established milestones in developing commercial crew transportation capabilities. NASA also is developing the Orion spacecraft and Space Launch System (SLS), a crew capsule and heavy-lift rocket that will provide an entirely new capability for human exploration beyond low Earth orbit. Designed to be flexible for launching spacecraft for crew and cargo missions, SLS and Orion will expand human presence beyond low Earth orbit and enable new missions of exploration across the solar system.